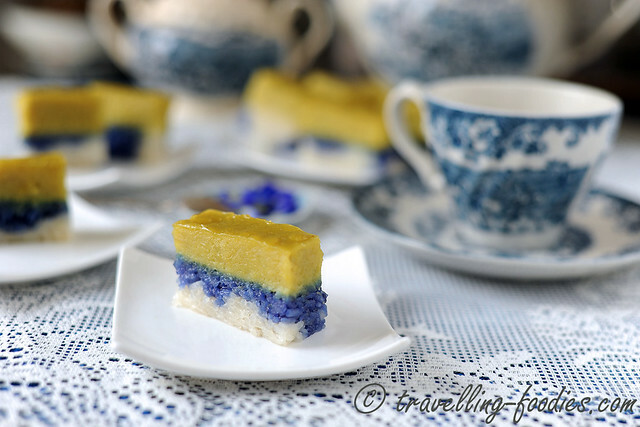 Kueh Sarlat is an immensely popular Peranakan chuchi mulot in Singapore. As I’d mentioned in my recipe post for Kueh Sarlat, it takes on “multiple identities” depending on which community or ethnic group you belong to. To the Malays, it is “Seri Muka” while it becomes “Gading Galoh” to the Peranakans in Malacca or “Pulot Serikaya”, amongst other permutations like “Puteri (Putri) Serikaya” or “Kueh Serikaya” or even “Puteri Sarlat“! I’d even seen one shop in town which spelt it as “kueh saalat”! Yes the one which sells each “wedge” of their “kueh saalat” at a notorious price of 5 bucks a piece! Like its numerous names, there are many variations of this kueh. In its rudiment form, the base is usually a steamed glutinous rice layer enriched by santan, while the top is a rich and wobbly custard. I reckon that this is the basic version which is known mostly as Pulot Serikaya. Then came the pandan version where a beautiful jadite green takes over the otherwise luscious golden hue. And of course the fun doesn’t merely end here. Apart from the pandan version, I particularly love kueh sarlat durian with fresh durian pulp added into the custard, heightening the creamy textures and providing the unmistakable complex cocktail of aromas and flavours from the king of fruits into the game. One either likes it or loathes it. I don’t just like it… I love it! 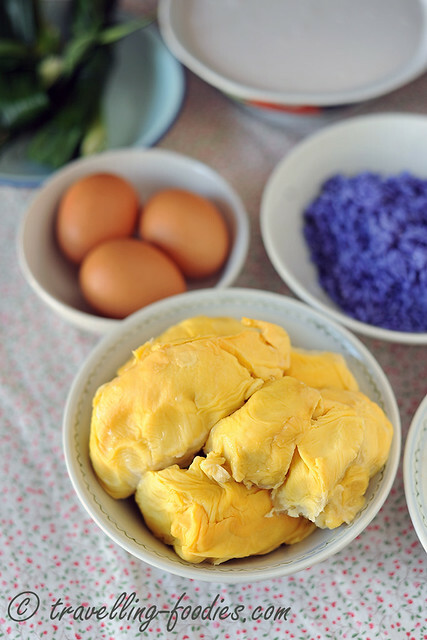 The ingredients for Kueh Sarlat Durian is merely an extension of the standard Kueh Sarlat aka Gading Galoh, with only one sole “new kid to the block”, none other than fresh durian pulp of course. 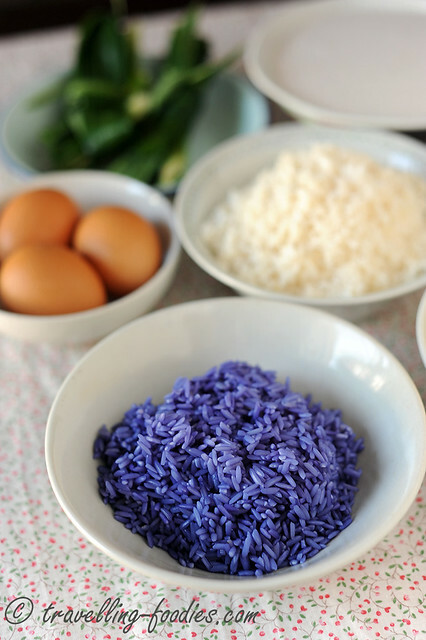 The glutinous rice is rinsed thoroughly before being soaked for at least 4 hours. I leave mine overnight over the kitchen counter, all plumped and ready to be steamed the next morning. 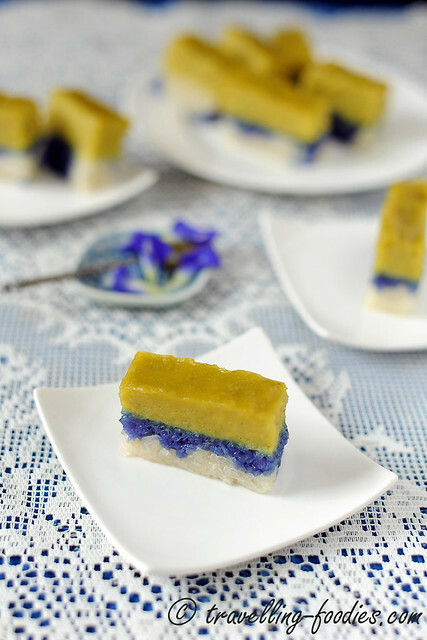 As with many Peranakan kuehs, part of the glutinous rice is stained to become a gorgeous sapphire blue through the use of bunga telang or known otherwise as the blossoms of blue pea or butterfly pea. Durian takes centrestage in this piece. The choice of durians is somewhat personal. Old hands in kueh making will tell you that the durian used for kuehs like this and apom balek are usually made from durians which are generally lesser desired for eating. This is echoed in cuisine as well as, like tempoyak a fermented durian condiment commonly served as a laok piring is typically made from lesser quality fruit. I have a penchant for durians which are more “bitter” than sweet which are incidentally those which are also more aromatic and thus suitable for kueh making. As such, I flouted the “rule” and used rather good durians instead, small seeds with thick and creamy flesh, a very good balance of bittersweet flavours making them very good for eating. But as I’d said, it very much depends on the individual. 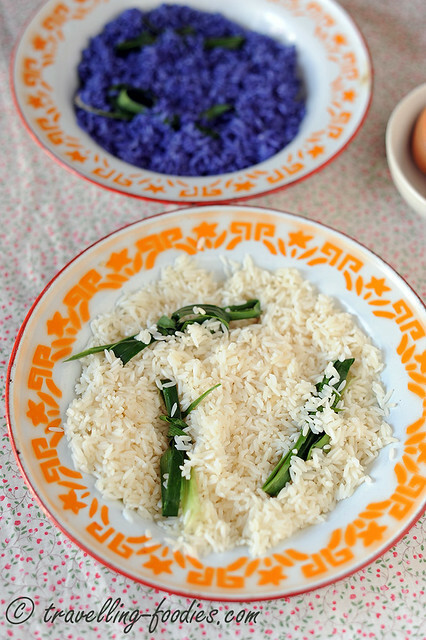 Coconut milk is drizzled onto the rice in two additions, first at the beginning before steaming and then the remainder halfway through steaming after the rice is taken out from the steamer and fluffed with a fork. 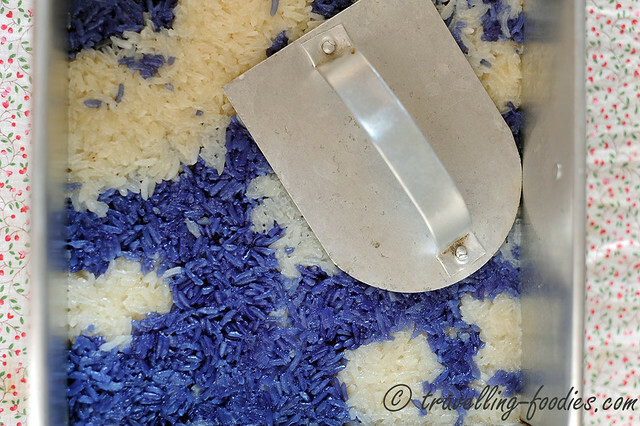 This helps to ensure that every grain is well coated with coconut milk and cooked thoroughly. While the glutinous rice is steaming over high heat, the durian custard is prepared, using the same trusty recipe I’d been using for kueh sarlat but with a slight adjustment made to incorporate the durian. The mixture is cooked over a bain marie until the custard begins to thicken and become more viscous as it gets progressively more difficult to work the whisk through the liquids.This takes place when the mixture is heated to about 70 degrees celsius, when the egg protein begins to cook and the starch in the mixture starts to react to the heat as well. Yes there is a starch component in this recipe in the form of plain flour and cornstarch. Rice flour would probably work as well, though I’m not entirely sure about using sago or tapioca flour. Whichever flour concoction one chooses to use, the serikaya layer should just barely set upon steaming and cooling, with the custard still so wobbly and uber soft. The last thing one wishes for is a hard and chewy layer of serikaya. 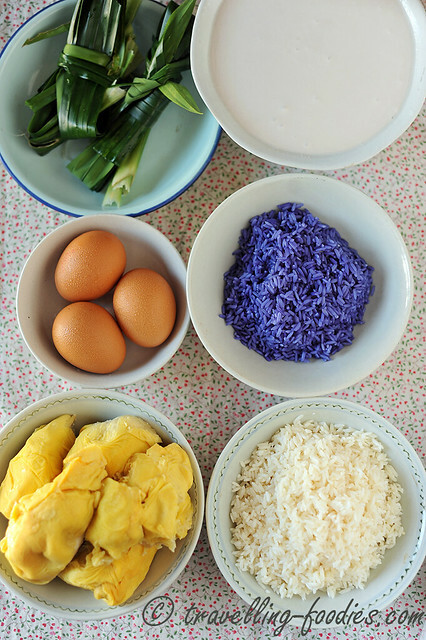 Keep a close eye on the details in the procedure described above and one should be on the right track to make a reasonably good kueh sarlat durian. If the first one fails to make your mark, troubleshoot and try again. There is no dummy proof recipe that would guarantee one to a perfect kueh sarlat, but only hard work would guarantee his success in making one to come. the bottom pulot layer is the same recipe as the usual kueh sarlat or gading galoh which I’d used and blogged here and here. Please refer to the links for the recipe. In a food blender, blitz thick coconut milk with durian pulp until smooth. There should not be any obvious fibres left, for a silky concoction to be made later. 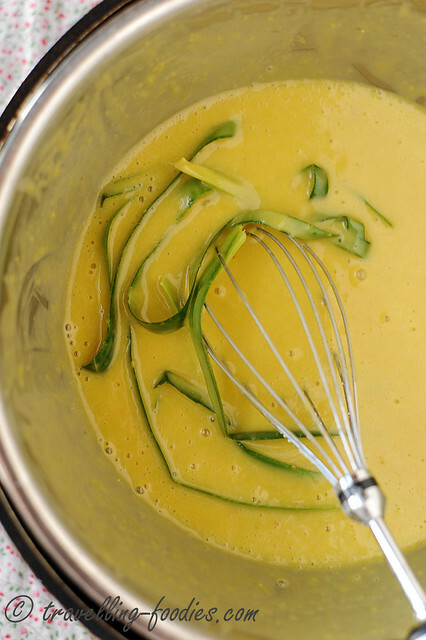 In a mixing bowl, beat the eggs to break the yolks before adding all the other custard ingredients and mix well. Place the mixing bowl over a water bath and stir continuously until the mixture begins to thicken. The temperature of the mixture should hover around 65 to 70 degrees when this happens. Remove and discard the pandan leaves. Pour the thickened custard over the compressed glutinous rice layer in the steaming tin and prepare for steaming. The steaming instructions are the same as those found for Kueh Sarlat or Pulot Serikaya as found here and here. Please refer to the links for the instructions. This entry was posted on April 28, 2015 by Alan (travellingfoodies). 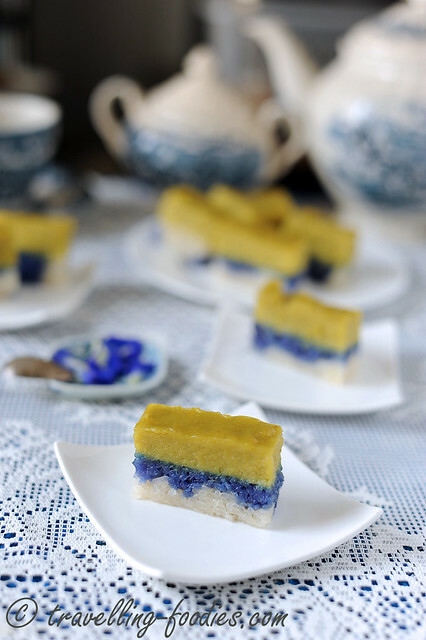 It was filed under Food, Simple Eats and was tagged with blue pea flower, bunga telang, chuchi mulot, custard, durian, fruit, gading galoh, glutinous rice, kueh saalat, Kueh Sarlat Durian, Nonya, Nyonya, Peranakan, pulot, pulot serikaya, pulut, Puteri Sarlat, puteri serikaya, Seri Muka, serikaya, straits chinese. Gorgeous durian pulp! I’m missing durian very much. This looks delicious!